I am very sure most of us (even if we are not True Fitness members), is still very much shocked by the news. Are you one of the TF members? The abrupt drop of such devastating news to members is uncalled for and pretty much irresponsible - no prior announcement, no compensation, no nothing or whatsoever.... for the members, it's a very terrible situation to be in, especially for new sign ups! A True Fitness spokesman told TODAY newspaper that the closures would not affect its Singapore outlets nor its expansion plans in China. I am not sure if I believe the last line. Definitely not. It is with deep regret that we announce the closure of our operations in Malaysia. 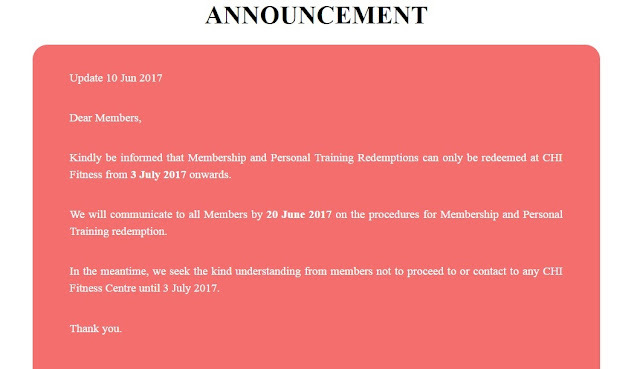 All True Fitness and True Spa centres in Malaysia will cease operations on 10 June 2017. Thanks to members like yourselves, we’ve been able to build a strong community of like-minded individuals who are passionate about wellness and health, and we value the support you’ve shown us. However, the past few years have proved challenging, and unfortunately the businesses are no longer financially viable due to evolving market conditions. We know many of you will be concerned about finding another fitness centre and have been working to find alternatives for you to continue your membership months and personal training sessions. Arrangements have been made with Chi Fitness for you to continue with your fitness regime with them. True Fitness members in Malaysia will have access to all Chi clubs except those located in Bangsar, Bangsar South (Nexus) and the Northern Clubs. Under the arrangement, True Fitness has purchased memberships for members to redeem and personal training sessions to be utilised at Chi Fitness. Redemptions can be completed online. We will be sharing further details on the mechanics for redemption at a later date. Redemptions at Chi Fitness centres will only commence on 3 July 2017. More details of this fitness provider can be found on their official website at chi-fitness.com. The validity of these redemptions for membership months and personal training will be for 24 months from 3 July 2017 or until all membership months and personal training sessions have been utilised. We are unable to refund in cash the unused portions of your membership months or personal training sessions. All terms of redemptions have been set by True Fitness Malaysia. We regret that Chi Fitness will not be able to facilitate service redemption queries. If you have any questions regarding this or any other matter, please contact our customer service at malaysia@truefitness.com.sg. Our customer service representatives will not be present at Chi Fitness. As for True Spa, we are looking for a reputable service provider to service your un-utilised sessions. We will be getting in touch with our affected members when we have more details. We apologise for any inconveniences caused as a result of the closure of the clubs and would like to thank you for your past support. Screenshot from TF NEW customer (newly sign up), Whitney. This is indeed a "wash my hands clean" situation. As of now, Whitney has yet to receive any news from TF team and she can't go any gym for now. Same for most of the TF members and the question remained: WHAT NOW? 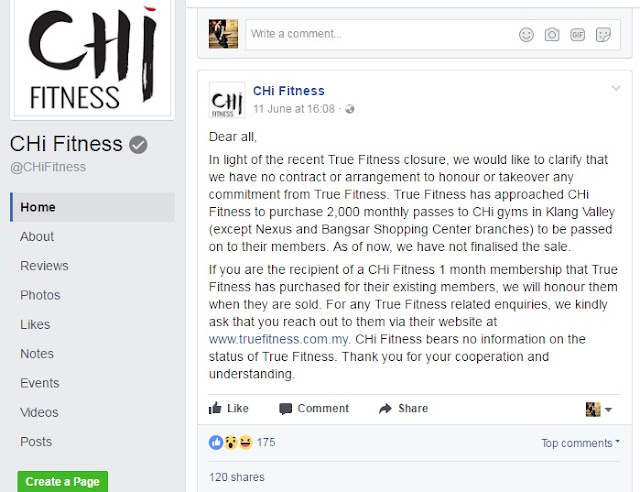 To make things worse (or clearer), CHI Fitness released a statement on both FB and their website on 11 June. As of 11am, there's 120 shares and members is venting on the comments. True Fitness members are directed to reach out to TF via website. Question: If you are CHI Fitness members, are you worried or concerned with the sudden announcement that True Fitness members gonna come over to your gym? If you are True Spa members, the question is not answered at all, as they are still looking for reputable spa to take over - but will any reputable spa willing to take over the members and services? Will the members be happy with the new arrangements? No one will know. I guess we all have to wait and see. As for the public, we all just want to know what actually happened! Meanwhile, if you would like to sign up with CHI Fitness, check out their FB and website. Alternatively, you can consider to sign up with a local gym that has full facility (except no swimming pool), one such gym is Work Out Studio in Kuchai Lama, check out their Facebook page here. If there's any update, I will post updates on my FB page.